The Rocky Mountains stretch for over 3,000 miles and pass through seven US states from Alaska south to New Mexico, but the most famous peaks are in Colorado. The Rockies make up about half the land in the state, in between the flat plains of the east and the canyon country in the far west, and the majority is protected as national forests, including the entire length of Colorado's section of the continental divide. 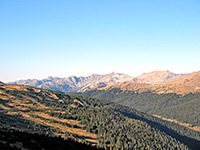 There are many candidates for the most scenic region, such as the Sawatch Range near Independence Pass and the state's highest peak Mount Elbert, or the Maroon Bells Wilderness near Aspen, but the area chosen in 1915 to form Rocky Mountain National Park is towards the north of the state, 60 miles from Denver - an area 25 by 20 miles in extent, which includes the northernmost fourteener in Colorado (14,259 foot Longs Peak), and is crossed by just one road, US 34 (Trail Ridge Road) between Granby and Estes Park. This scenic highway also has the distinction of being the highest paved road in the USA; because of the massive winter snowfall it is generally open for just five months each year, between late May and mid October. The rest of the park never closes. Also near Estes Park, several other roads penetrate a little way into the mountains, most popular being to Bear Lake, while state route 7 passes along the southeast edge of the national park, though as is usually the case, the best way to appreciate the scenery is by hiking, starting from any of over 30 trailheads - see listings for the east and west. Paths lead along valleys to waterfalls and beautiful glacial lakes, and others climb to summits high above the treeline near the continental divide, with most routes concentrated along the US 34 corridor and the seven mile section of the Rockies between Flattop Mountain and Longs Peak. 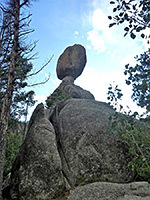 Areas to the north and south are much less popular, so although the region close to Estes Park is usually very busy, the park still offers vast areas of unspoilt land where few people visit. 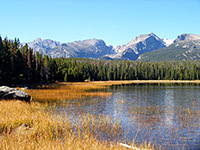 The main town serving Rocky Mountain National Park is Estes Park, a few miles from the east entrance. Other nearby towns with hotels include Loveland and Longmont both on the east side, and Winter Park in the west - follow the links for hotel descriptions and reservations. The only approach to Rocky Mountain National Park from the west is via US 34 from Granby (see map). 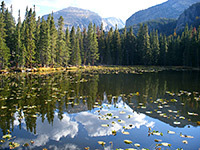 The road passes three large lakes (Granby, Shadow Mountain, Grand; the latter two part of Arapaho National Recreation Area), enters the park just past the resort town of Grand Lake, then runs northwards alongside the Colorado River. The lakes also lie along the river, which flows down from the north through a wide, grassy valley (Kawuneeche) between two 12,000 foot ridges; the Never Summer Mountains to the west, and various summits to the east including Specimen Mountain and Mount Ida. The continental divide runs along both sides of the valley, looping across the top near a tiny lake (La Poudre Pass), which is the source of the river - from here the Colorado begins its 1,500 mile journey to the Gulf of Mexico. The hillsides enclosing the river are generally smooth and partly wooded, and the scenery along the highway is not as rugged or spectacular as on the east side of the park, though the landscape is still pretty, especially in fall when the aspen and grasslands along the valley floor take on their bright orange-yellow hue, and the peaks above receive their first snowfall of the season. Along with Moraine Park in the east, Kawuneeche is the best place in the park to spot wildlife, including elk. From the visitor center next to the Grand Lake entrance station, US 34 winds through the woods lining the east side of the valley, passing eight picnic areas, one campsite (Timber Creek) and several trailheads of which the two most used are Coyote Valley (not accessible to RVs), where an easy, level path follows the river for half a mile, and Colorado River, near the north end of the valley as the road begins its climb into the mountains. From here, the main destination is the site of Lulu City, a former gold and silver mining town, though little remains today apart from a few planks from wooden cabins. Just north of the Colorado River trailhead (the point above which the road is closed for the winter), US 34 ascends steeply up the east side of Kawuneeche Valley, crosses the continental divide at Milner Pass (10,758 feet) then reaches Poudre Lake, source of the Cache La Poudre River. The road climbs further along the hillside east of the river and leaves the forest behind as it enters the stark tundra zone, where the tallest plants are just a few inches high. Now for the first time the full grandeur of the park is evident, as countless rocky summits meet the horizon in all directions, some bearing snow all year. The high country has its own visitor center (Alpine), usually open between late May and early October, near which the highway reaches its high point (12,183 feet), near Iceberg Lake and the volcanic Lava Cliffs. The road remains in the tundra for several miles more, as it heads eastwards along Trail Ridge, 2,000 feet above a deep, pathless valley formed by Big Thompson River. There are two other points of interest along the way - the Tundra Community Trail, which climbs gently for half a mile to a rounded summit, and Forest Canyon Overlook, a fine viewpoint high above the river (see 360 degree panorama). Trees start to return near Rainbow Curve (10,829 feet) as the road begins to descend, rounding the upper end of Hidden Valley and reaching a hairpin bend (Many Parks Curve), where the east edge of the mountains comes into view, centered on the wide valleys of Horseshoe Park and Moraine Park. The curve is the westernmost point from Estes Park reachable in winter as the road is not plowed any further up. 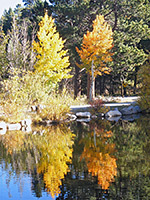 The highway then descends to Hidden Valley, which has a picnic area and is a good place to view the aspen colors in fall. The final stop along this section of the road is Beaver Ponds, where a short boardwalk trail leads to an overlook of the slow moving creek that meanders through the tall grass along the valley. 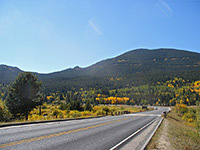 Two roads enter Rocky Mountain National Park from the east, starting at Estes Park: US 34 alongside the Fall River and US 36 past Beaver Meadows. The Fall River road soon reaches Horseshoe Park, a wide, marshy meadow (see 360 degree panorama) that encloses the river for several miles westwards, until the land starts to rise. The upper valley provides a course for the original route across the mountains (Old Fall River Road) - this is unpaved but still open for travel one way, from east to west. The road is narrow, steep, winding, and not suitable for vehicles over 25 feet. It rejoins US 34 at Fall River Pass (11,796 feet), near the Alpine visitor center. The first three miles of the east end are fine for all vehicles, however, and have many quiet stopping places at pull-outs, good spots to contemplate the scenic surroundings without the heavy traffic often found along the main highway. The road also passes one short interpretive path (Alluvial Fan Trail), which explores a large boulder field formed by a flash flood down Lawn Lake Canyon, as recently as 1982. South of the Old Fall River Road junction, US 34 climbs a little and meets US 36, then begins its ascent towards Trail Ridge. Between the US 34 junction and the Beaver Meadows entrance station, highway 36 winds across a short stretch of hilly, wooded land passing one major turn off, the Bear Lake Road, which leads to the most scenic area of the park. It descends into the wide open valley of Moraine Park, passing a museum and a side road to the largest park campground (a 245 site facility, open all year), and two trailheads, for the paths to Fern Lake (and other destinations) and Cub Lake. 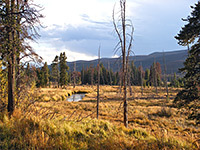 The main road crosses the meadowland (the most popular location for elk viewing in the fall) and starts to climb, meeting one smaller valley (Hollowell Park) and several other trailheads of which by far the most popular is Bear Lake, at roads end (9,475 feet). 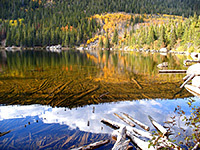 A dozen pretty lakes are within range of a day hike, as is Flattop Mountain on the continental divide. The mountain, three glaciers and several of the lakes can all be seen via an exciting 13 mile loop hike. Other places along Bear Lake Road include scenic Sprague Lake, circled by an interpretive trail, the more distant but still easily reached Bierstadt Lake, and Glacier Basin, which has another campsite (open May to September). Also from May to September a free shuttle service runs along the last few miles (beginning at Moraine Park Museum), in order to reduce congestion at the trailheads. The one route south from Estes Park is state highway 7, a busy road that climbs into the hills and enters the national park near Lily Lake, which is small but photogenic, and circled by an easy half mile footpath. Another trail leaves the far side of the road for Twin Sisters Peak, an isolated summit with excellent views in all directions. The highway soon peaks at Wind River Pass (9,095 feet) then exits the park, descending into Tahosa Valley, but two side roads branch off westwards. One leads to the Chasm Lake/Longs Peak trailhead, start of the difficult, 8 mile route to the highest summit in the park. The other is to the Wild Basin trailhead, gateway to the remote southeast corner, and the start of several long trails along river valleys to backcountry lakes and waterfalls.